Noé Mendelle is the director of Al Khadra: Poet of the Desert, part of the POETS IN PROTEST series made by SDI Productions for Al Jazeera English. Noé has previously blogged about the shoot for this film in the Western Sahara. Today, she is sharing her observations of Al Khadra, the renowned Sahrawi war poetess. Now in her late seventies, Khadra has been composing verse about freedom since she was a child – and about the conflict with Morocco over the last 36 years. 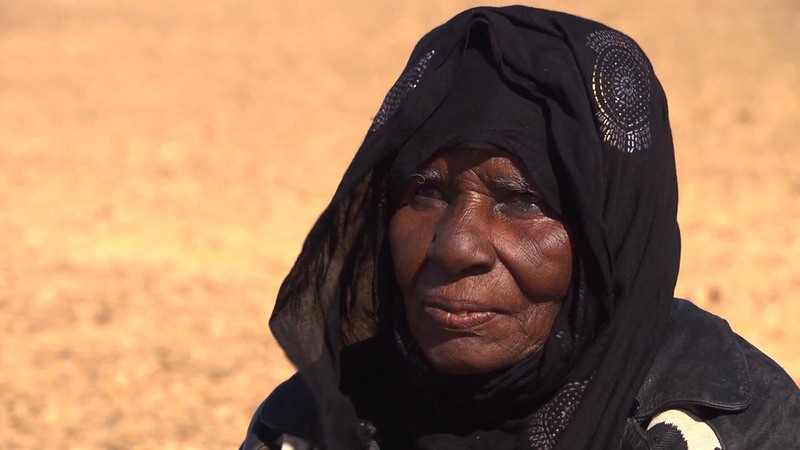 She became the Sahrawi poet and is known amongst her people as “Poet of the Rifle”. I wanted to start the film with the “wall of shame” as a way of introducing the history of Western Sahara and bring Khadra face to face with her enemy. And helped themselves to what they wanted. To us she just said, beating her chest: “It hurts right here to think that I can’t access my land. I have been living in poverty in a refugee camp all my life, thanks to this wall. It is terrible to stand here knowing that right now the Moroccans are exploiting our resources, leaving us with nothing but sand and despair.” She then laid out her coat and started praying. That was enough to sum up her deep sense of betrayal by Muslim brothers. Wherever she is, Khadra prays five times a day and yet she is very inclusive and tolerant to other members of the family who do not follow her. Khadra was brought up as a nomad and loves talking about her childhood, playing freely with the other children while looking after goats. She must have been quite a girl; she even managed to break her front teeth from a fall! She also started composing verses from an early age. Her mother was a poet herself and used to win regular poetry competitions held by the Bedouins. Khadra entered for the first time as a teenager and won. Her mother never took part again, bowing to Khadra’s talent. Khadra’s poetry is an oral recording of the Saharawi living history. Her work expresses a great deal of anger at the injustice and violence in her part of the world, but while her poems are always politically engaged, they are also deeply personal in her descriptions of battles. Khadra told me the lovely story of having been invited to a congress of poets many years ago in one of the camps, and she was the only woman. Everyone attending was asked to come prepared with one poem – she of course had two. Just as the recital was about to begin, the electricity went off. None of the guys could read their poems in the dark. Khadra stood up and recited her two poems and more. She was the only poet there who did not know how to read and write and only relied on her oral memory skills. This episode of POETS OF PROTEST can be seen on Al Jazeera English from Friday 5 October at the following times GMT: Friday 19:30; Saturday 14:30; Sunday 04:30; Monday: 08:30. British Summer Time is GMT+1h. Very interesting article on one of the most famous poet of Western Sahara, the África’s last colony.